Today I wanted to share another outfit that I put together from the Nordstrom anniversary sale. My top, Jeans, Shoes and earrings are included in the sale. 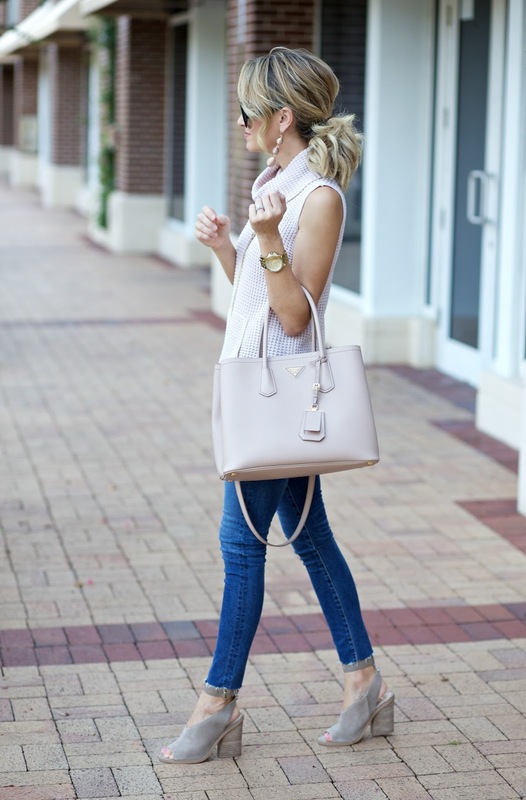 This sleeveless sweater is perfect for transitioning to Fall. I love the pocket in the front! And it can be dressed up or down pretty easily. These Ag jeans are an absolute favorite purchase from the sale. I have worn them a bunch already. They fit really well and I love the raw hem. Also, these shoes! I love Marc Fisher shoes every pair I own are really comfortable. I just love these for Fall. The color os perfect. Don't forget to enter the giveaway in yesterday's post. I am giving away a $100 Nordstrom gift card. The winner will be announced tonight. Fall fashion inspo! Never too early to get started. First off, I want to say that I absolutely love your style. I've been following (and shopping!) your Instagram looks for a few months now and I just love your classic and timeless looks. I always love the jeans and leggings you wear, however I'm only 4'11 and struggle with the fit when it comes to length. How tall are you and is there a brand of jeans you would recommend for someone that has the same petite frame as you but a bit shorter? Love the earrings- are they heavy? I love the bag! I think your picks from the anniversary sale are some of the best I've seen! Fall vibes for summer temperatures .. love it! So cute! I need those booties! Such a lovely photos, esp. that 1st with the little one in the back! :D I like your style and how you always look so effortlessly stylish! I am IN LOVE with this outfit!!!!! It is amazing! Those shoes?!!? OMG. Love your style-so sophisticated but still functional and comfy! I love all your pics! I love this look!! You are so cute! That top and shoes are so cute!! This top is so pretty, I love how you styled it! i can't wait to get these Marc Fisher boots! Also, these earrings are AMAZING! I think I'm going to get myself a pair also! As always great job, this outfit is beyond awesome. Loving the shoes! They look comfy. I love all the sweaters! So ready for fall! The lace dress is GORGEOUS!! The cupcakes and cashmere sweater is my absolute favorite! I would love to get it �� Thanks for your hard work on this post I love seeing outfits put together so I get an idea of ways to pair items with other things! The mustard top is legit the cutest! you are the sweetest ever! Thanks again for doing another giveaway! Love following you! Everything you've shown is so cute, I can't pick a favorite! Although I do have to say Andi's shopping pictures are the cutest! I got those booties in black love them!!!! Need the cut out tops so cute! Everything you are posting daily is so cute!!! Adidas sweater must! That cut out sweater dress!! And jeans!!! Thanks again for posting these finds! Love everything you picked ! That pink little vest is so adorable ! Perfect for fall. I can't wait to wear all the cozy sweaters !!! Thank you for awesome finds ! Thank you for sharing the inspiration for Fall! Love your look!